Enjoy this four-part videotaped coverage of Deacon Study Day featuring presenter Deacon Bill Ditewig. Deacon Shewman was ordained to the permanent Diaconate on September 24, 1984 for the Diocese of Agaña, Guam (Mariana Islands). Six months after his ordination the Diocese was split and he was assigned to the newly created Diocese of Chalan Kanoa (Northern Mariana Islands), where he ministered until November 1997. Since then Deacon Shewman has ministered in the Diocese of Erie. He has served in a wide variety of ministries. While in the islands he served as Diocesan Chancellor, Tribunal Judge and as Director of the Deacon Formation program, among others. With the Diocese of Erie he serves as a Tribunal Judge, an adjunct professor with the Master of Pastoral Studies program at Gannon University and he is assigned currently for pastoral ministry as a deacon at St. Luke Church in Erie, PA. Deacon Shewman has a number of academic and professional degrees, including the Licentiate in Canon Law from Catholic University of America (JCL-1995) and a Doctor of Ministry (D.Min.--2005) from St. Mary Seminary, Cleveland. 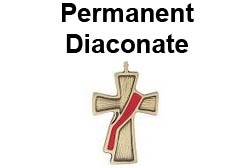 This very informative video developed by the Diocese of Toronto tells the story of the Permanent Diaconate by sharing the individual witnesses of deacons and their wives.